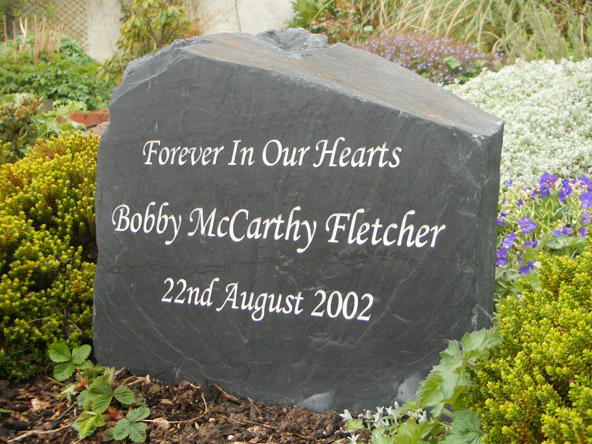 Peoples Tribute can create a unique upright memorial stone headstone made from Welsh slate, sandstone or yorkshire stone, each tailored to your exact needs. All our stones are hand-picked from UK quarries. We select only the very best rocks for our memorial products. Freestanding upright Natural Rigged Edge, plaques with or without stands. 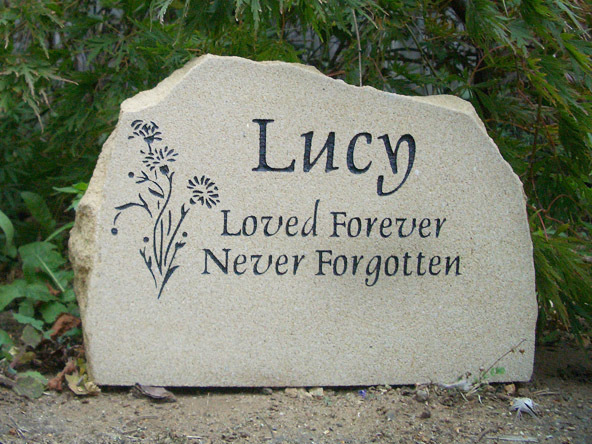 Since early 2001 we have been creating and selling stone memorials online. 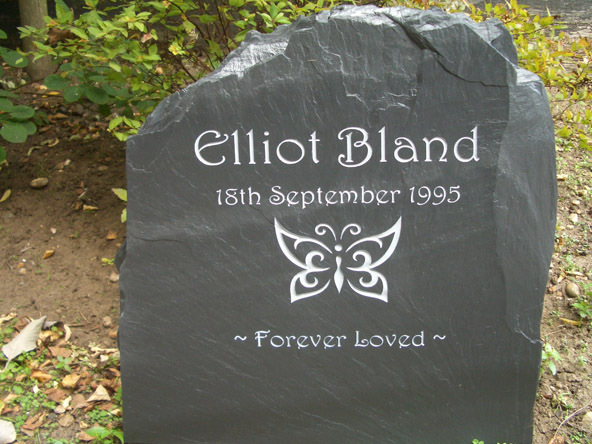 To date we have provided many thousands of sandstone, yorkshire stone and welsh slate headstones for people who want to memorialise their child or loved ones. 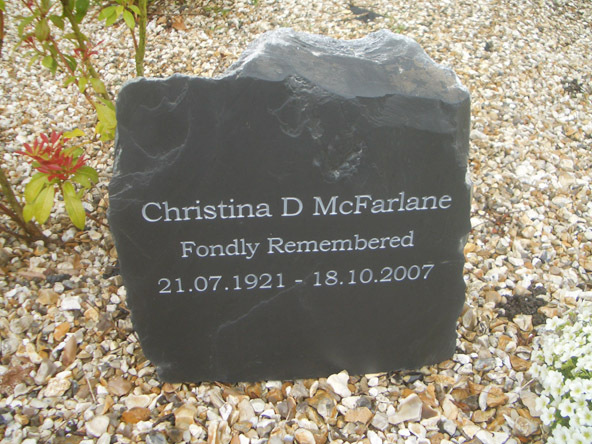 Our extensive experience means you can feel confident we will provide you with the perfect slate memorial stone you require, whether as a remembrance for a burial, grave marker, or perhaps a marker for the place where ashes were scattered. We are adept at making fitting memorials for children as well as adults and can even incorporate childrens art or drawings on to the stone in most cases where required. As you look through the examples on our website, you can see actual headstones we have created and delivered to our customers, and all have received excellent feedback. Below is a sample of images customers have sent us, showing the final setting of their marker. If you see one you would like us to replicate, keep in mind each stone has its own natural shape, but we will do all we can to match it as closely as possible. We also carefully check every stone memorial to make certain it is free from cracks that would spoil its beauty. In addition, we choose only those stones which have a natural and pleasant shape. Thickness can vary from rock to rock, but our quarry pickers in north Wales make sure our stones are at least 50mm thick, and up to 80mm. Please contact us if you require a specific thickness and we will do all we can to meet your request. We suggest that for the larger upright memorials that they are secured into the ground as they can be quite heavy. We can supply stainless steel rods that can be adhered into the base of the memorial and set into cement or concrete or any solid base. Some cemetery’s will insist upon this method of securing as a health and safety precaution. It’s also a theft and vandal deterrent. 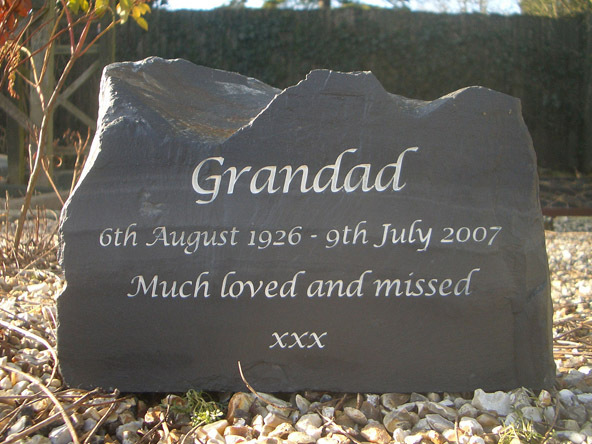 We have made customising your headstone memorial easy. Our unique tool allows you to fully design your stone exactly the way you want it. Just click on the link “Design and Buy” under the slide presentation. You will be shown dozens of preloaded fonts, from elegant, to professional, to funky. The only limit to the number of characters in your message is the size of the stone. Next select your stone form and shape, and make it even more personal by adding an image from our many choices. You can also upload your own custom image for us to engrave on the stone. You will find the tool very easy to use, but if you have any problems or questions whatsoever, or would rather us design it for you, simply call us and we will take care of everything you need. After your design has been determined, we will send you a mock up for your approval. 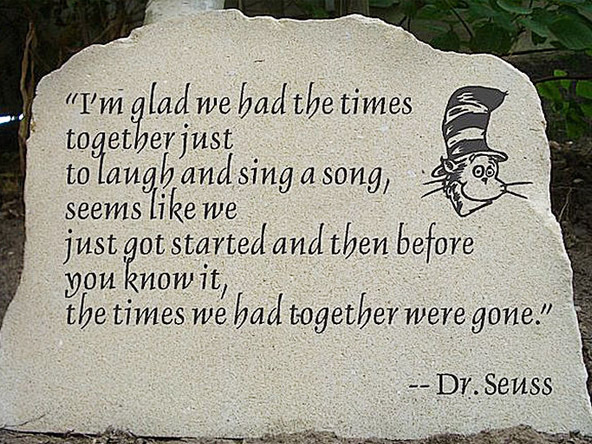 Our plaques fit harmoniously into any remembrance area or garden. They look beautiful laid flat on any kind of rock, pebbles, shingle or grassy surround. Your stone can also be mounted vertically on a wall, or even a standing post. Any of these methods can be accommodated. Screw fixtures and pre-drilled holes, as well as countersinks can be added on your plaque for easy and secure mounting. The fittings can be hidden so there is nothing visible on the stone’s face. A resin fitting can also be made to secure your stone, if you prefer there to be no screw holes in your plaque.